LARGE INVENTORY in USA and Canada. FREE SAMPLING* & CATALOG policy! BLANKET ORDERS with Release Dates, allow our customers to obtain lower pricing! 2D/3D CAD Available for Download! *Sample Policy: Samples will be sent out once Sales has qualified the correct product(s) for your application. Max. Sample amount can not exceed $5 unless approved. Why not offer the best solution? If you want to solve a Strain Relief requirement – Don’t settle for less! If you are looking for a cord grip to seal a connection in a dust tight, hose down, or even a submersible application – the Sealcon design with its NEMA 4X and 6 (IP68 and IP69K) and 150 PSIG pressure rating as well as V0 flammability rating according to UL 94, is unsurpassed by others. Solar, Wind, Oil & Gas (ATEX / IECEx), Pumps, Filters, Fans, Transducers, Sensors, Scales, Flow Meters, Lighting, Motors, Encoders, Power Supplies, Antennas, Harnesses for Pool & Spa, Car Wash, Dairy, Food & Beverage, Pharmaceutical, Petro, Telecom, Automotive, Traffic, Robotics, Medical, Packaging, Automation, Marine and many more Industries. NEMA 4x and 6 or IP68 – submersible! Also meet IP69K! V0 flammability rating / halogen & phosphorous-free - unsurpassed! UV & Ozone stable UL f1 746Crating on Black Nylon dome/flex Fittings! 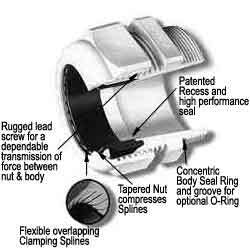 O-Ring Groove and Ratchet for increased safety! Large inventory in Denver – no minimum purchase requirement! Accessories: Mounting plates, DIN rails, Hinges, Gaskets, Fastening lugs, Brass inserts, Extension frames, Etc. Corrugated Conduit Liquid Tight in Nylon, and Superflex with Fittings. Thanks for all of your business!